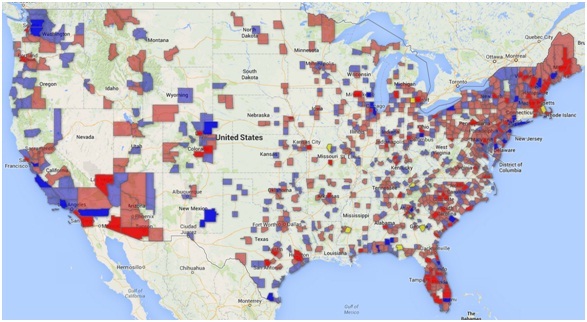 Last March, we published a map based on Census data showing migration in and out of Hartford County, including the curious finding that more people move every year from the Seattle area to Hartford County than from Hartford County to the Seattle area. 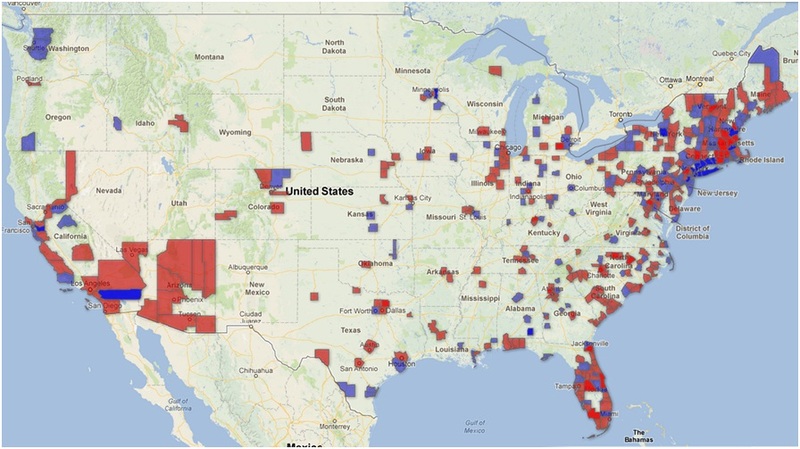 The Census Bureau this week came out with updated numbers, based on surveys conducted from 2007 to 2011, and that data again suggest the Nutmeg State has a strange lure for West Coast hipsters. For what is likely the first time ever, blacks who were eligible to vote went to the polls at slightly higher rates than whites during the 2012 election in which Barack Obama won a second term, newly released Census data show. Survey results released Wednesday show that nationally, an estimated 66.2 percent of eligible blacks cast ballots last November, compared to 64.1 percent for non-Hispanic whites. 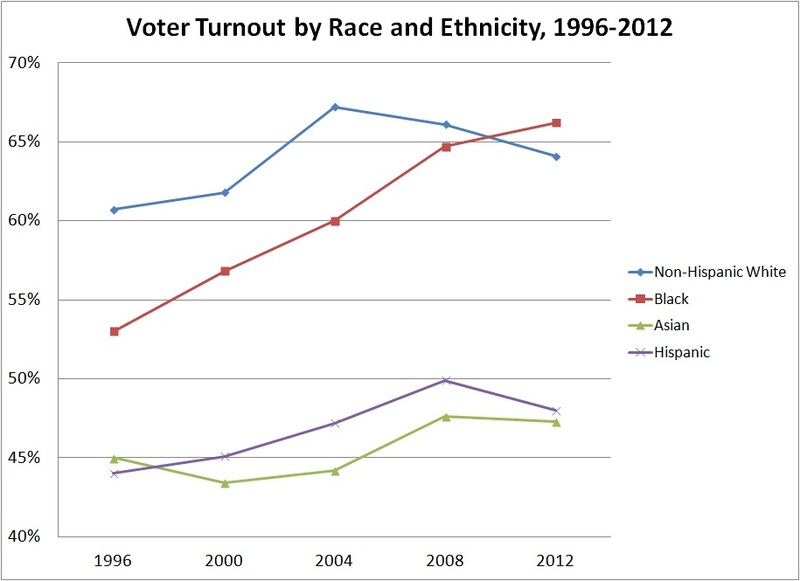 Those rates closed what had been a significant gap in voting by race in the years before Obama was on the ballot. In presidential elections from 1996 to 2004, whites went to the polls at rates 5 to 7 percentage points higher than blacks. Although blacks voted at higher rates than whites nationally, the numbers varied considerably across the country, the Census Bureau reported. Generally, voter turnout by blacks exceeded whites in the East North Central, East South Central, Middle Atlantic and South Atlantic regions of the country. White turnout generally exceeded that of blacks in the Mountain and Pacific regions. Asians and Hispanics continued to lag far behind whites and blacks in voter turnout, the Census numbers show, with neither group topping 50 percent nationally. But while the percentage of eligible Asians and Hispanics who voted dipped in 2012, their raw numbers increased due to demographic shifts in the voting-age population. 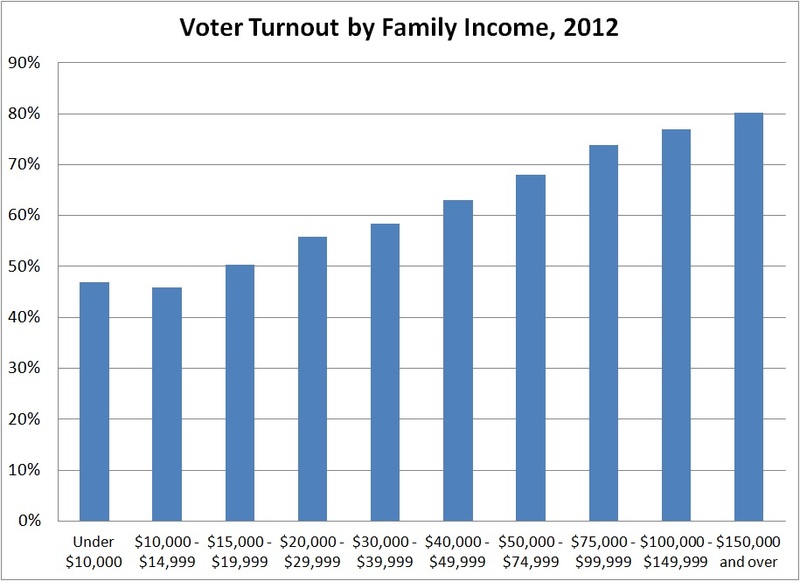 About 1.8 million more voters went to the polls in 2012 compared to 2008, an increase driven entirely by non-white voters. Overall, 2 million fewer whites cast ballots at the same time there were an additional 1.7 million black voters, 1.4 million Hispanic voters and 550,000 Asian voters. Non-Hispanic whites still accounted for the great majority of ballots cast last November, but their share is dropping. In 2012, whites made up 73.7 percent of all voters. Twelve years earlier, that figure was 82.5 percent. The Census numbers also show a continuation of familiar patterns, with higher voting rates among women, those with more education, and those with higher incomes. 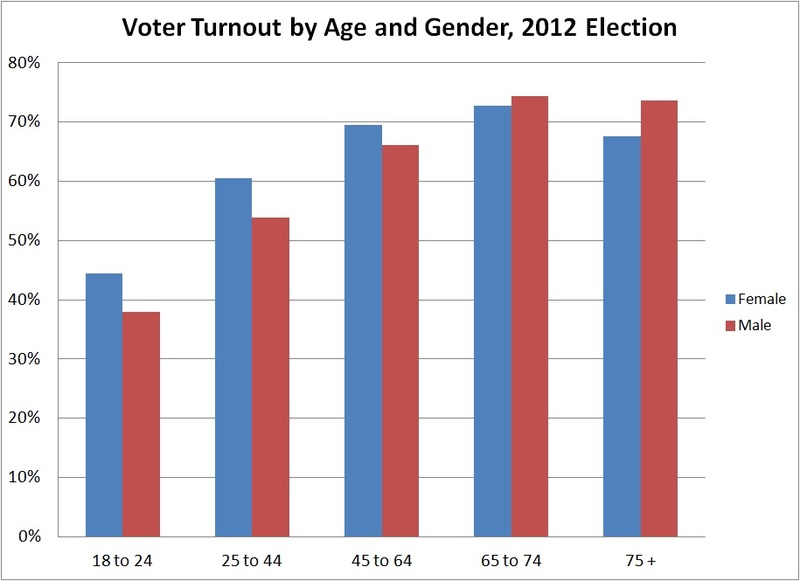 Voter turnout also generally increases with age. 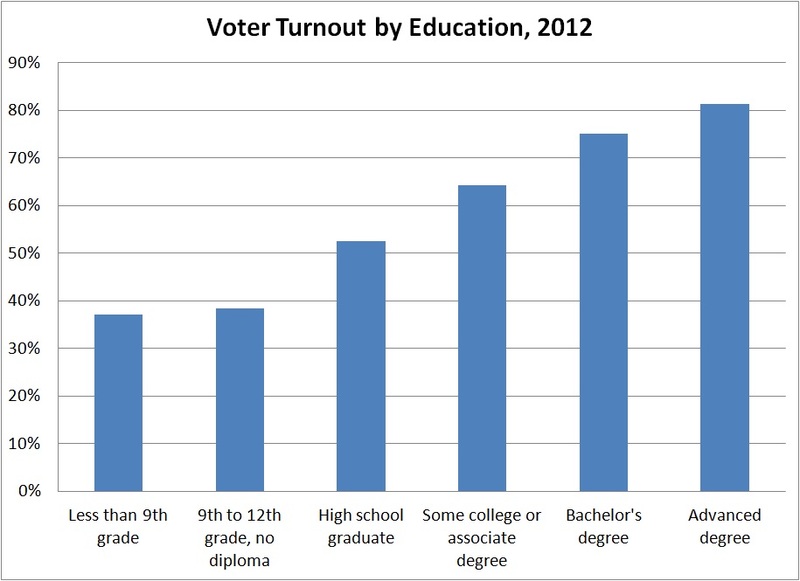 In Connecticut, total turnout by those eligible to vote slightly exceeded the national average – 62.7 percent for the state compared to 61.8 percent for the country. 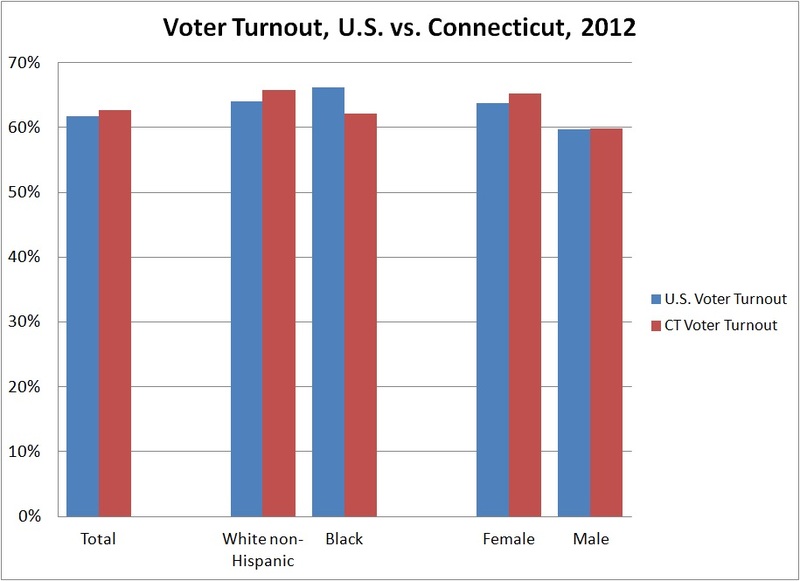 But blacks in Connecticut did not head to the polls at greater rates than whites. In Connecticut, non-Hispanic white voter turnout, at 65.8 percent, exceeded the national average while black turnout, at 62.2 percent, lagged the nationwide figure. Census numbers for the state also show that men voted at rates similar to the national average, while women topped the national average by more than a percentage point. Overall in Connecticut. 59.9 percent of eligible men voted, compared to 65.3 percent of women.